On my way to and from Pennsylvania to see my Dad, I stopped over at my sister's home in New Jersey. It makes the trip shorter and gives me a chance to visit and help her with projects. I can't share our most creative project right now - it is for a surprise that hasn't happened yet! This time I had a few craft supplies with me, actually a rather odd assortment. She needed a couple of cards and so I figured we should try to make them. Since I didn't know ahead of time that she would need the cards so we had to get creative with the things I had along for one card the first day. On my way back, I added a few items that I bought when I checked out the Tuesday Morning shop near my Dad's. When you have less to work with, it can be fun to tackle the challenge of making a card even though you don't have all of your usual tools and supplies. 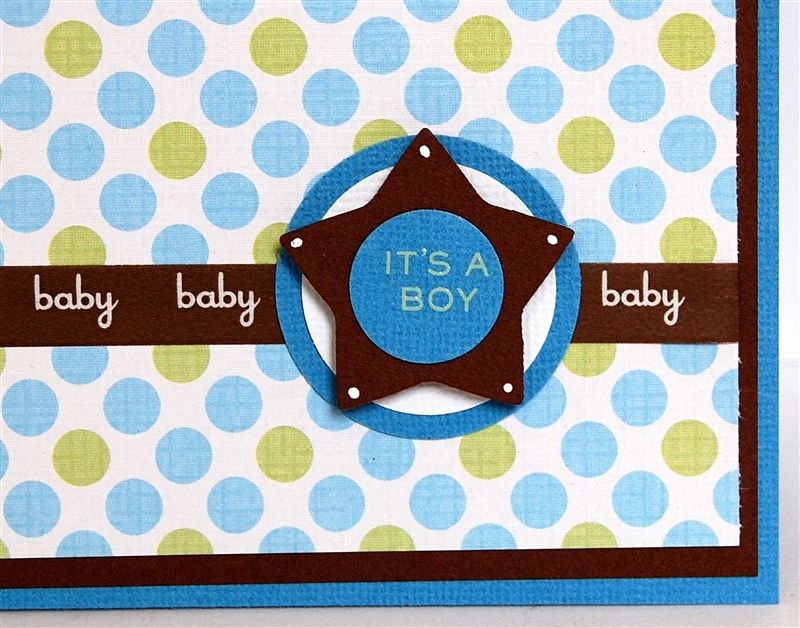 I found the baby ribbon from American Crafts and some Martha Stewart "It's a Boy" rub-ons for less than $1 on clearance. As is often the case with things you find on clearance, the rub-ons were a bit old and we had some trouble with them. The sentiment was supposed to be surrounded with a circle of small parallel lines. When these failed to transfer properly after a few attempts, we simply punched out the words and added layers of punched circles and a star that we made with her Creative Memories punches. 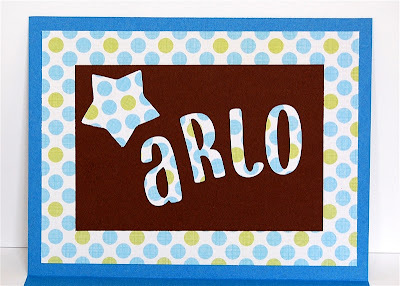 This baby boy has an unusual name, "Arlo" (I couldn't stop humming "Alice's Restaurant" while we were working on the card!). Fortunately, I "enabled" my sister into buying a Cricut Create when Michael's had a clearance a year or so ago so we were able to use the Don Juan cartridge to cut out the letters inside the card. 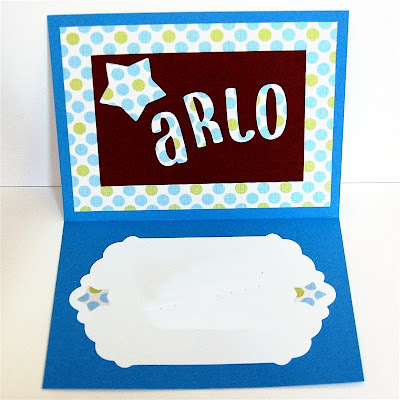 At home, I often use a border punch to create an attractive white insert to write on for a dark card but we didn't have any to work with. I looked through her small selection of cartridges and remembered that Winter Woodland has some nice tag shapes. The blackout on the shift level created this solid shape and we added a few more punched stars to tie everything together (I smudged out the personal message written on the card in this photo). The card is an unusual size - we made it to fit a spare envelope that she had already. 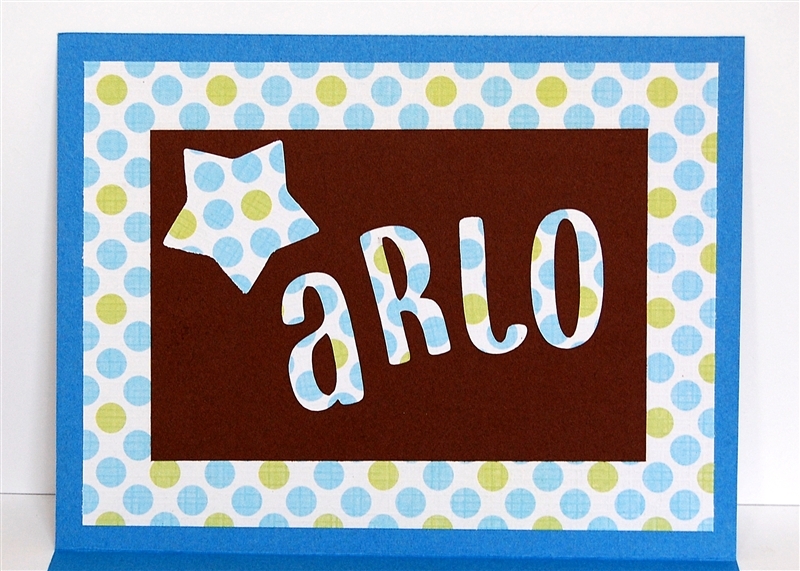 The other card we made was this simple sympathy card. The decorative paper is from Webster's Pages (the warehouse sale box that I purchased recently was one of the things I had tossed in the car to show my sister). 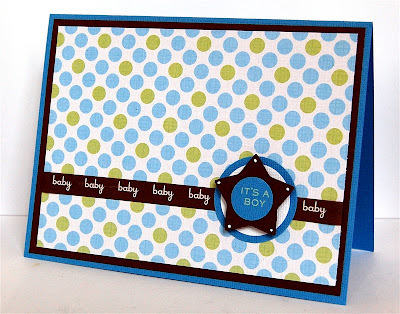 The sentiment is one of the Craftwork Cards printed shapes that my friend Enfys gave me. It is very handy to have these on hand and I happened to have thrown them in my box of goodies to take along. The green in the printed design was a close match to a Martha Stewart travel themed mat stack that I had in my box - you never know what will end up working together until you try it. I didn't have any appropriate ribbon for the left side but two strips of the same green paper were an acceptable alternative. I had a nice time with my Dad. He is better than he was but still having some problems with strength in his legs. With some more physical therapy we hope he will soon be able to go back to his own apartment. Thanks for all of your kind comments and get well wishes. Special thanks to Mary Ann who has sent him some lovely get well cards. I was worn out from my travels and didn't get to post this for an early morning release as I usually do - I am home now and starting to catch up! Welcome home! Glad you had nice visits with your dad and your sister. I have no doubt that you were worn out from your travels--I get tired just reading about all you do! Your energy is amazing to me. I send you best wishes for continued improvement for you Dad, and rest for your weary self. You MUST rest up--you have a Welcome home to enjoy!